Tech companies protested FCC net neutrality proposal with “Go Slow” but did it make an impact? Today Was the “Go Slow” Protest of the FCC Net Neutrality Proposal. Did You Notice? 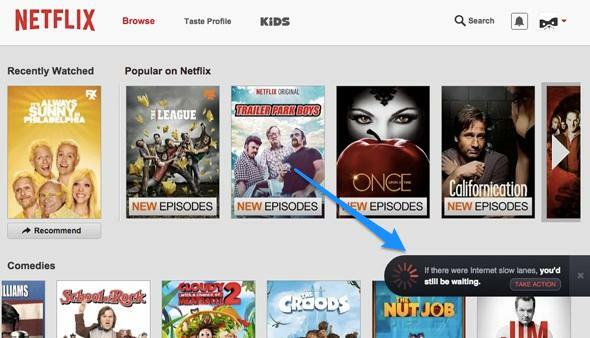 A page loading graphic on Netflix. We’ve all felt the helplessness and frustration of trying to load something and instead getting the spinning wheel of death. But we usually associate it with crummy Wi-Fi or DSL, not net neutrality issues. So open Internet advocates decided to take our built-in visceral reaction and turn it into a tool to protest the FCC’s pending net neutrality proposals before the open comment period ends Sept. 15. Big tech companies like Netflix, Mozilla, PornHub, and Reddit added an animated loading symbol to their services that says, “If there were Internet slow lanes, you’d still be waiting.” The source code is available so anyone can add the symbol to their site, and the idea was that everywhere you went on Wednesday, you would see that awful spinning out of the corner of your eye. The initiative is similar to the SOPA/PIPA protests that lead Wikipedia to black out its site for an entire day. But the little load symbols aren’t quite as dramatic a statement as locking users out of a site they want to visit. It seems like the analogous protest action would have involved sites intentionally slowing their services down for a day to let users feel how bad things could be. Indeed, that’s what tech investor Brad Feld proposed back in May. The blackouts were really something that we hadn’t yet encountered on the Web and that we wanted to try to prevent. The spinning wheel of death is something that people encounter every day. [Right] now we are operating without strong net neutrality protections, and we’ve seen some of our colleagues in the space actually have to live some of those implications that we’re all afraid of. You think of a partner like Netflix, their users have had real consequences from these issues that interfere with their ability to use the product. … It would just be too subtle. Of course Wikipedia is supported by a nonprofit, whereas for-profit companies have to worry about sacrificing revenue and users if they slow their sites for a day. But if the message doesn’t go out loud and clear, some of those sites could slow forever. The protest was far-reaching, but Jon Oliver may still be the one who’s had the most success letting people know what’s up.